A friend just sent me an email that was attached to a story from my semi-distant past. It was written by a man from LA who accidentally happened into our gallery. I met him at the door and offered him a cup of coffee. He was full of fun and kept asking questions, the answers to which frequently made both of us smile or laugh. Fenn employs an impressive antique Hopi Indian basket to collect about $1,000 a year for the Special Olympics fund. In one of our back gallery rooms we paused so he could take my picture standing behind a large Hopi basket. It was so big that no arm could reach the bottom. That’s why we used it to collect donations for the Special Olympics. The bottom six inches was filled with paper money of all dominations, including a few fifties and some hundreds. He laughed when I said we always watch lanky guys from LA who had long arms. During a leisure lunch his desire to write a story for People surfaced in our casual conversation. I suddenly became apprehensive and sensed that my criterion for immortality was tenuous. “Don’t worry Forrest, it’ll be a love story,” he said. Forrest Fenn is a Santa Fe, N.Mex. art dealer with a bustling, eight-room gallery, but one of his most prized acquisitions is a 36-inch alligator, Beowulf, who inhabits a pond on the gallery grounds. In artsy Santa Fe, riddled with some 110 galleries, lots of folks think they detect a resemblance between Beowulf and his owner. It is an unkind comparison, no doubt the result of professional envy of a colleague who makes big waves and bigger bucks. The controversial and flamboyant Fenn grosses about $6 million a year by flouting tradition. His collection may politely be called eclectic: a jumble of Indian artifacts and curios, mixed with expensive paintings and bronzes. He openly sells forgeries of Modigliani, Monet and Degas, and he gets good money for them to boot. Indignant colleagues grumble, but Fenn doesn’t snap like an alligator; he only smiles like one. He gets most of the celebrity collectors who come to town. Forrest and wife Peggy get into the act with, “The Hopi Indian Dancers”, a five ton sculpture carved from a single piece of limestone by Doug Hyde. It sells for $120,000. Following that principle, Fenn tucked his showrooms off Santa Fe’s main strip and enclosed them behind 11-foot-high adobe-and-stone walls. In addition to the pond, the elegant grounds feature a garden, exotic birds and three guest houses. One of them, attached to the gallery, is stocked with volumes of books, fine wines and $1 million in art. When the rich visit Santa Fe, Fenn scoops them up at the airport in his limo and lodges them free of charge in one of the houses. Jackie Onassis, former President Ford and Cher are among those who have been pampered with catered meals, a Jacuzzi, steam room and a masseuse. Many, notably Steve Martin, have also bought art. Fenn encourages gallery browsing with signs that read: “Please touch. We are responsible.” Customers can handle any of 2,000 Indian bowls, moccasins and arrowheads. Big spenders might be drawn to a $375,000 painting that Corot signed on his deathbed, or a $350,000 Remington bronze. Fenn’s collection of fine fakes (owned in partnership with Texas’ ex-Gov. John Connelly) is the work of the late master forger Elmyr de Hory, who fooled many an expert in his time. But why sell phonies? Says Fenn: “If you love it less when you see the signature who now is the fake?” That challenge has shamed buyers into taking 26 De Horys so far, at $9,500 a shot. Fenn, who was born 55 years ago in Temple, Texas, has a bottom-line style that was shaped in the Air Force, where he won 25 decorations, including the Silver Star. Stationed in Lubbock, Texas at the end of his stint, he began buying sculptures from struggling artists and casting limited-edition bronzes of them. Some of the bronzes he sold for cash, but the rest he traded for Indian artifacts. When he was ready for retirement, the hobby provided an inventory for opening an art gallery, which seemed the logical next step. This entry was posted in Forrest's Scrapbooks and tagged Clues, Forrest, Forrest Fenn, hidden treasure, marvin fenn, park, Poem, temple texas, Treasure Hunt by dal. Bookmark the permalink. Thought I could be first for a change got beat by a german. Love that store it sounds like a snapshot of your life back in the hay day.Strange how I can find clues in it or am I up too early..
“Charming one moment, gruff the next.” I love that about him. Probably a big reason he is so successful in everything he does. I think your going to love this post…. Life is like playing Monopoly…Ha!!! Fred, you are correct. In life, you have to spend money to make money…..in business, sit on your money and your business dies. Great article……the past seems to hold the same true character of today. love it. Where did you get the amazing Hopi basket? If there is a hint in the story it is the word “alligator”. I know of a place by that name. I’m not physically able to get up to it. But it is a good place to hide.. I wonder what happen to his alligator Beowulf? Did he conquer the dragon who was guarding the treasure? I’m going to go read more about the battle maybe there are some clues in it…. Beowulf and Elvis made their way back to Louisianna. Its great to see that guys like you and Dal (Americas finest young men) who survived the horrors of Vietnam found fulfilling passions in life, to move on and occupy your minds. I can’t imagine either of your larger than life personas holding down a desk job. Fun reading the People article! Joseph P. Kennedy if memory serves me correct. In June 1962, Eunice Kennedy Shriver started a day camp for children with intellectual disabilities at her home in Potomac, Maryland. She started this camp because she was concerned about children with intellectual disabilities having nowhere to play. Using Camp Shriver as an example, Shriver, who was head of the Joseph P. Kennedy Jr. Foundation and part of President Kennedy’s Panel on Mental Retardation, promoted the concept of involvement in physical activity and competition opportunities for people with intellectual disabilities. Camp Shriver became an annual event, and the Kennedy Foundation (of which Shriver was executive vice president) gave grants to universities, recreation departments and community centers to hold similar camps. thanks. That was interesting learning the history of who started Special Olympics. I learn something new here each time I sign on. Back in 1992 I had the honor of having the winning cover design for the area Special Olympics and i remember having to put Joseph Kennedy on the cover. You are still correct in my opinion… It was the Kennedy money that funded the project so you could say he started it in a sense… It was just her idea. You’ve inspired so many of us to dream like kids again and reach for adventure. Mr. Fenn, the bronze work of Doug Hyde, did you cast his bronze statues in your foundry? The more I read about Forrest the more I realize that he could teach me a lot more then I think I know. Forrest you are truly an amazing man in my book. For me I keep drawing jokers. Maybe some day I will hold the cards to make a decent hand. BW, yes we used to cast Doug’s Hyde’s bronzes but we sold his stone sculpture in our gallery long before he started casting. I have two of his marble pieces in my home. Maybe I’ll post photos of those pieces here. Doug is a Nez Perce Indian and very talented. his son, Buffalo Hyde, also sculpts. Well I can’t let this one go. Are you serious about that name???? If so poor baby. I seem to be really good at saying stupid things these days. There is a sculptor by the name Frank Buffalo Hyde. Mr. Fenn, I thought you were being funny. Yet again, I feel foolish. This is a link to a really good article about him and his work. My apologies, Mr. Hyde. So if its important to notice what Forrest leaves out are we now looking for a blaze painted by Frank??? Here are our two Doug Hyde stone sculptures. The chief is 28″ tall, carved from alabaster and weighs about 80 pounds. The Indian maiden with the pot is carved from marble and is 22″ tall. She weighs about 80 pounds also. Doug and I started in the art business at about the same time. That was 1972 and neither of us had much of a client base. But advertising paid off and after two years we were giving Doug a million dollars a year for sculpture he consigned to us or things we purchased outright. When Buffalo was born missing his right arm we felt terrible but I am proud to say the handicap has not bothered him much. I am amazed at what that man can do with one arm that I never could do with two. Stone sculptures always amazed me most. The artist has to know what he is doing from the start since he cannot add back stone he removed. Thank you so much for sharing. The gift of seeing such beauty in a piece of stone and bring it to life is rare. Both father and son use their gifts well. 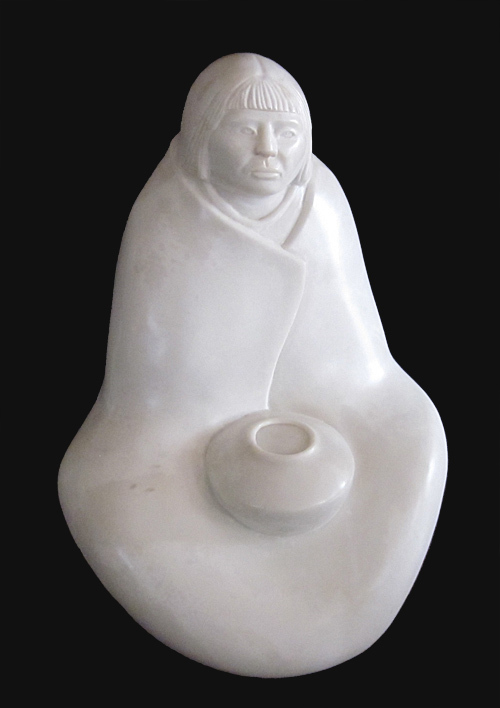 Doug’s Indian maiden is beautifully carved – I love his use of the stone’s natural grain and shape to define the subject. I remember running around the gallery as a kid…not fully appreciating ALL the wonderful creations you had collected…from all over the world! I miss the old days in Santa Fe! And I agree with you about my brother, Buff. He could always do more and better, than us two pawed people. We’re all very proud of him…and Dad too. Hello Zenja. These are the times when one wishes to hear such stories you and your family experienced. Thank you for sharing and glad to see you posting. This has always been my favorite part of the article. Small minded people are jealous of other’s success. Get out there and do for yourself what Forrest learned to do. That’s right he earned and learned what was needed to be a business success. Nothing was handed to him. Jealously and bitterness are akin to an animal trap. The one trapped chews off his own leg instead of asking for help out and turning it into something positive. He’s taught his own kids and grandkids the same philosophy. A successful businessman is one who follows the lead of the other who,s more successful then oneself. To be negative is a downfall. Those that bicker will never get anywhere in life. Forrest, I admire you and your success and admire Peggy to have endure all your endeavors. A man needs a very strong woman behind him. Here you go, hope link works. Thank you for asking! Thank you for sharing nearindianajones that is very cool and I like your design… How old were you when you did that? Very cool cover design. You should be proud!! I have a wee bit of artistic ability and the only thing I’ve ever done with it is win a 5 yr olds coloring contest. Business if u think big it will become big. Success is what Forrest is, if you do right then things happen right. He has most definetly been Blessed. It’s nothing to be jealous about, I’m proud for him and others that reach up high. Spallies, would you kindly tell me where or how you add an avatar photo for Dals blog. I haven’t been able to find a link. Thanks! Thank you Spallies! I’ll work on it tomorrow from a computer rather than phone. Interesting article……so why did Fenn post this? Anyone that has done the least bit of research has read this long ago. I think he’s trying to bring the Fenn Mystic Club down to earth with a little reality about himself and the art world……I don’t think it will phase them but at least he tried. I admire how Fenn shows the frivolousness that is the art world. The “17 dollars per square inch story” and his statement about the forgeries. People loved and were so moved by the art work until they found out they were forgeries. “If you love it less when you see the signature who now is the fake?” He shows that marketing is everything or at least most of it. Like he said; give him two hundred and fifty thousand dollars and he’ll make you a famous whatever you want to be. You can stop reading now unless you’re really bored……Over the years this article has hit a personal note with me on a couple occasions. My wife used this article to get me involved in the chase. Not long after Fenn published TTOTC I had minor surgery. Even though I wasn’t at the hospital but a few hours I was supposed to “take it easy” for awhile. So I gave her a “humph” and started reading; she left the room. About half way through the article I stopped reading and hollered at her, “Hey! Did you just call me a goofy old guy”; all I heard was chuckling from the other room. The rest is history, Goofy_Old_Guy was born and I was hooked on the chase. So Goof was born a “hurrumph” kinda guy right from the start…figures!! So what I gathered from all this is that your wife was right, and you……..
Actually, I wish I could get my wife interested in it they way your wife got you interested in it. English is my wife’s 3rd or 4th language. I think it is her 4th, but she has not spoken her 3rd in so long that she does not remember it well. Because of that, english poetry eludes her, British comedy confuses her and about the only stories I have known her to enjoy are ghost stories, if I read them to her. Maybe I can convince her the TTOTC is a ghost story. But on a bright note, she does like to travel, so hopefully, someday soon, we will be able to take a vacation. I know just the spot I would like to visit. My wife really doesn’t care much about the chase one way or the other. She did encourage me to make comments on the blog. All of the years I’ve worked on computers I’ve never made comments except recently about the chase. I always thought folks that make comments need to turn off the computer and get a life in the real world. Look at me now. That’s the paradox that is the chase; Fenn hid the treasure to get folks off their gadgets and out into the wilderness and here we are conversing with him on our gadgets. I can certainly relate to your wife. Poetry completely eludes me and British comedy has never made any sense to me; and with my Texas accent some folks don’t think I speak English. We are trying to catch 22 torquoise beads in the great outdoors and become caught up in the chase 22 hours a day. (Yes, I lay awake until 4 am some nights solving the poem in bed). I love British comedy makes a lot of sense. Dry sarcasm. Yes I see your point, but it’s also true that people are going to places that they’d never have gone to had it not been for Forrest’s chase. I for one have gone on many special trips “Yellowstone” and others… and I know two other people that have gone to places they would never go except for the chase. Yes Ed I agree, there are some that are using the chase as an excuse to get themselves and their families out exploring the wilderness. Fenn has posted many great stories about searchers out enjoying the wilderness as he intended. But there have been many blinded by gold fever that drive right past some of the most spectacular landscapes on the planet, oblivious to anything but finding the gold. There’s no way to know but I wonder what the statistics of the chase are. It has been an eye opening experience for me seeing how obsessive some people are and what the lure of getting rich quick does to some people. Perhaps this is normal and I just need to get out and be around more people…….On second thought, maybe not. A sad but true statement, Goofy. Folks lose themselves or obsess over an idea of riches…gold fever…even to the point of being an addict. How many will go through a major withdraw or worse, when all is said and done. Have most forgot the fun in it all? This challenge is a poker game… never get involved in the game if you can’t take the loss. Eye opening? Maybe. Sad, definitely. Goofy, there are worse things to be addicted to. People who have an addictive personality type spend their whole lives going from one addiction to another. Deb, someone wrote a poem on poetry page long time ago about Solvaholics:) IMO it’s a fun hobby and no different than puzzle solutions or crossword puzzles people work on daily -as long as you don’t waste excessive time or family funds set aside for other things. Every day that I learn more about you, the more I want to know. Despite what some may say, there is no away around the good deeds you do. If knowing people by their fruit is any indication, I would bet the apples on your tree are golden. I started the chase about 2 years ago, but what sealed the deal for me (in terms of authenticity) was how special Renelle was to you. It was obvious, and it won me over in a big way. The Special Olympics hold a special, secret place in my heart. Thank you for donating to that cause. Have you been to the only restaurant owned by someone with Down’s Syndrome? It’s been coined the “happiest restaurant on Earth.” I think it’s in ABQ. Yes Mindy, its called Tim’s Place. Mr. Forrest,thank you for doing what you did for the special Olympics.my little girl Jamie whom I have told you about in the past was born with downs Syndrome.she loved the special Olympics.I still have some of her ribbons.4 foot 10 ” and such a blessing to my family.she was my youngest.at age 27 in the year 2006 ,she went to see jesus.we miss her so very much.its people like you ,that make my day. love you. I watched a documentary last night about this French guy who started out just being an obsessive cameraman, meaning that camera NEVER left his hand, and it was always filming. Well, then he met Banksy. Followed him around and Banksy actually liked being filmed and trusted this guy. He helped Banksy pull off a HUGE art show and a lot of celebrities were there. Finally, after a while, Banksy grew tired of the French guy, and told him to go off and make his own art. So he did. And it was crazy, way out there pop art that came off as pretty creepy (to me, at least). Then he wanted to do an art show to rival Banksy’s. He was wild, out of control, too occupied with the interviews and being as grandiose as possible to the teenage girls coming to get his autograph to put together a show in time. He sold everything he owned to hype this art show, and with six hours left until the doors opened (lines were already forming in the street), not a single picture was hung. Amazingly, he started throwing up pictures haphazardly at the last minute. And what do you think he made? About a million dollars. Just by cutting, pasting, and photoshopping. I’m glad Forrest was sussecful better him than John Kerry. Teresa Heinz Kerry’s personal fortune is reportedly worth as much as $1.2 billion, stemming from her earlier marriage to former Pennsylvania Sen. John Heinz III, who died in 1991 in a helicopter crash. Much of John Kerry’s own wealth comes from his own family trusts. Worth as much as $125 million according to his disclosures, Kerry had been the wealthiest U.S. senator until he joined the Obama administration last month. I had just read this article online the day before yesterday but it didn’t have the pictures. I always love seeing the pictures. Seeing things like that Hopi basket is always better than I imagine them. Nice article. I do appreciate the efforts you have put in to donate your time and money to the Special Olympics. My nephew is 6 years old and he has Down’s syndrome and he lives on the Pacific coast in Victoria. When I read this story it was warming to me, especially the part about the Olympics. That reminded me of the Soldier on Program that is similar to the Wounded Warrior program. I was the first person designated as OPI (officer put in charge) for this program and I remember envisioning our goal to some day have an olympic class athlete developed through our program. Of course my boss thought that dream was too high and I replied … “Aim for the stars and we may hit the moon”. Some day I feel we will meet that goal but time will tell. Thanks again or the reminder of what is important. Any consolation prizes for asphalt jungles? I wonder what convinced Mr Fenn to get into art since he had no interest in it. I wonder what Forrest’s favorite token was to play as in Monopoly? I always liked the cowboy in the set that my parents owned in the 1980’s. Sadly the cowboy token faded away at some point between then and now and no longer appears. More recently, Hasbro replaced the iron token with the cat token. Sensing the media hunger to sell more games, they have now announced that all of the remaining classic tokens could now potentially be replaced with completely new ones! Is nothing sacred?! Oh well, compared to newer board games that are being sold today, Monopoly really isn’t that fun anymore anyway. It takes too long, players slowly get eliminated one by one, and the winner enjoys a victory that is bittersweet at best. The documentary “Under the Boardwalk: A Monopoly Story” is a fun watch and goes into much more detail about the history of the game. Did Somers ever purchase an O’keeffe from you? If so, which one was her first?